I never quite understood what this was about. 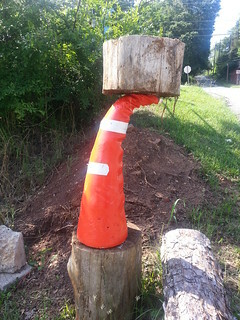 It appeared to be a traffic cone, but it was solid material. I just felt like sharing it here. I saw this in 2013 on North Pope Street. Contractors have been installing new video detection systems for traffic signals along Milledge Avenue this month. I saw a lot of this equipment being installed along South Milledge over a week ago. Video detection has replaced a lot of the loop detectors (metal detectors) used in pavement over the past few years for Athens' traffic lights. I am not sure about all the capabilities of this new system, but I suspect it monitors traffic flow to some extent in addition to the mere presence of stopped vehicles waiting to enter an intersection. For example, when southbound traffic on Milledge backs up all the way to Broad Street, westbound cars on Broad waiting to turn left on Milledge are not given a green arrow. Does anyone have more details on how this system works? The ladies cheered for me as I ran up the walkway toward the Gamma Phi Beta house, and I felt like cheering, too, because I had just been offered the use of solar viewing glasses at the peak of darkness during our 99% solar eclipse. I had not expected to get a chance to get such a good direct look at the sun during the most magical moment of our eclipse, but I had all the luck to be in the right place at the right time. 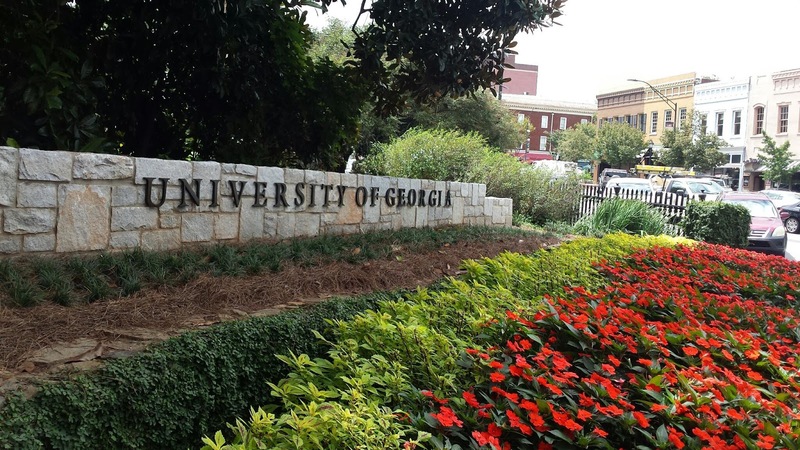 I'm a bus driver for the University of Georgia. (If that is news for you, then read this article on why I left law practice to become a bus driver.) August 21 was just another workday, and with so many part time student workers marking themselves as "unavailable," I expected to be at work driving around, so I had no idea if I would be in a place where I could park my bus to take a look. 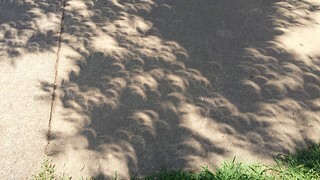 Besides, I had not found any solar viewing glasses, so I did not think I would get to look at the sun. I did see an Athens Transit driver put on a pair of glasses and look up while her bus was at a service stop, so of course I felt a little left out. Before the eclipse, I heard on our two-way radio that Sanford Drive at the stadium was full of pedestrians going to the eclipse viewing party. As I made my trips on the Milledge Avenue Route, I picked up passengers carrying solar glasses, and many of them had no backpacks, which indicated they were not going to class. One passenger asked me "Are you excited? ", so I explained how I didn't know what to expect to see today. She told me that she had gotten a tip on solar glasses being available at a particular store in town and bought a pair before they sold out. I can understand why traffic is so bad when fall semester begins at UGA. Students are finding their way around, buying textbooks, doing other shopping, and making whatever other preparations they need for a new academic year. But why does it take over a month to lighten up to a normal amount of traffic? Why does it not lighten up once students get their textbooks and settle into a routine? One idea I've had is that perhaps a lot of freshmen and transfer students eventually learn that driving so much is not worthwhile due to the time it takes with so much traffic and so they eventually learn to reduce their trips and become more efficient. Another has posited that perhaps students drive less and walk more when the weather cools off. Oconee crackdown on distracted driving spurs ‘staggering’ number of stops: Oconee County Sheriff’s deputies and Georgia State Patrol troopers went looking for distracted drivers Friday morning and the number of cars they stopped surprised even them. The sign is different. This is the corner of Broad and Jackson. I just noticed. The Town and Gown Players are performing the comic melodrama Die, Mommie, Die! tonight through Sunday night. If I can get this straight, the story is about a pop-singer mother who murders her film-producer husband and the daughter who wants to avenge his death by killing the mother. The son of the family slips the mother some LSD to get her to admit the murder, and this works, but the "mother" also admits she is actually their aunt who had previously killed their real mother. And then the story just gets more twisted. The performances are August 10, 11, and 12 at 8:00 p.m. and August 13 at 2:00 p.m. with a ticket price of $5.00. More information on Die, Mommie, Die! can be found on the Town and Gown Players website, though I don't know where to find an explanation for the unusual spelling of "mommy" in the play's title. 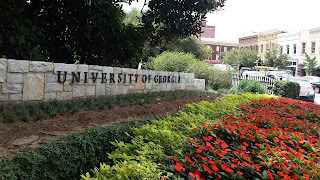 Sorority and fraternity recruitment begins today, so stay off Milledge Avenue unless you (1) work there, (2) live there, or (3) have ample leisure time to watch college students crossing the road and admire UGA's fleet of transit busses. Who would have thought that the simple reading of a new book and a lavender cup of latte from Jittery Joe’s would have landed me the experience I had this morning? This encounter has consumed my mind all day and I want to share my story. In order to enjoy my coffee and to be able to focus on my reading, I walked around downtown until I found a park bench with the smallest amount of sun shining on it so I wouldn’t sweat and melt down into my shoes. Edward, whom I would meet in a few moments, was charging his cell phone while sending text messages to his family and friends. His friend, George, whom I would also meet very soon, was outside laughing and talking about how he had a jelly bean in his pocket (that he carried around) because he didn’t like jelly beans. Edward, his friend, was trying to guess the flavor George might like (or what candy in general his friend would enjoy if not a jelly bean). The guys were having so much fun, I couldn’t help but listen to them laugh and cut up. They were so positive and full of life! I stopped reading my book and walked over to introduce myself and George went inside Subway to do whatever it is that he does in there. Edward began looking around in his backpack for sandwiches to give his friend to eat. Both, I would learn, are homeless! Edward and I chatted a bit and I learned that he was invited to Harvard University years ago to work on his MBA. He decided to become a firefighter and is recently retired from that job. His eyes sparkle with enthusiasm when sharing his story! George, when invited out of Subway to come join us, was encouraged by his friend Edward to sing for me so that I could learn of his musical talents. He began singing Josh Grobin’s song, “You raise me up,” and sang it loud enough for many of those walking by to hear and enjoy. 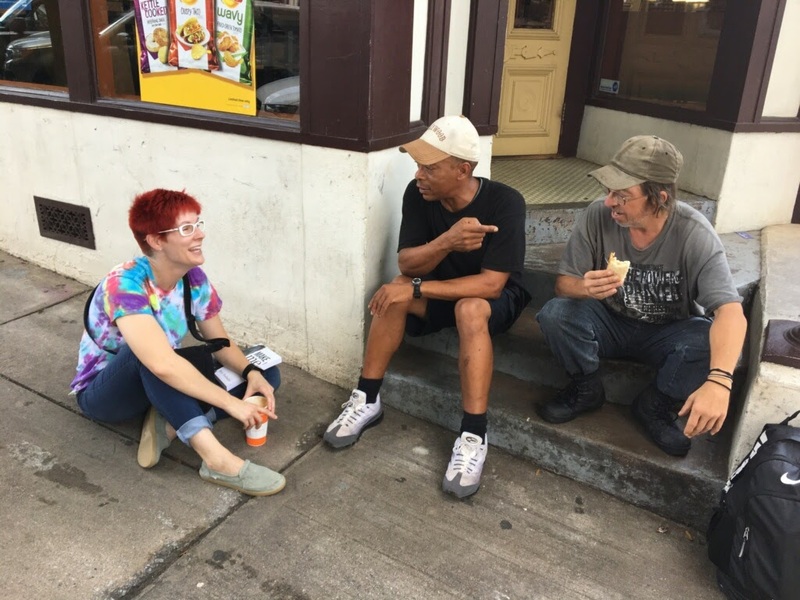 The nice thing about this encounter with Edward and with George is that I have recently been homeless and I understand what it is like to have absolutely nothing. No food, no clothes, no way of bathing, etc. What the three of us shared in common was our ability to choose happiness and to roll with the punches. We all agreed that life will pull you down at times. Life will also be good to you at other times. One of our “good times” today was sharing our moments together and living in the moment created just for the three of us to connect and become friends.